Slick branding and advertising is dead. Well – maybe not dead – but it’s something that you should really think twice about before using it in your business. Instead – authenticity is in. It has been in for some time. 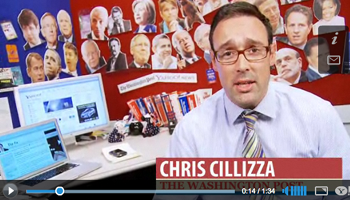 Washington Post writer, Chris Cillizza, illustrates in this post how a political campaign can be low key and authentic (we at Folk Media like to call it “folksy”). I believe this can work very well for business too. Here’s your assignment for today. It’s an easy one. Watch this video and leave a comment below this post with your one key takeaway. How can you begin to incorporate authenticity into your business and marketing messages? It’s obviously a lot more than breaking out a whiteboard. In a future post we’ll break down some ideas on making your business more authentic by using social media and online marketing. After years and years of Mad Men style advertising, people are craving human interaction on every level…. personal, spiritual, social, and even in business. As a side note – Chris Brogan has some exciting projects around this idea of humanity in business. He’s written a book (Trust Agents) and has just launched Human Business Works. Check these out. He always produces good stuff. Watch the video above and leave a comment on how you will take action today to make your business more authentic. « Does Twitter.com Even Stand A Chance Against Twitter Apps?